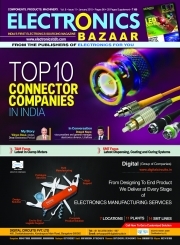 Description of "Electronics Bazaar, January 2015 (eBook)"
Are you searching for information like top 10 connector companies in India, the latest clamp meters, the latest dispensing, coating or curing systems in India or the information regarding the LED lighting industry in India? Get your copy of the latest issue of Electronics Bazaar today to find out the answers to all such questions at one place. Electronics Projects Vol. 14 by EFY Enterprises Pvt. Ltd. Reviews of "Electronics Bazaar, January 2015 (eBook)"